View the Smoky Mountains from inside or out. Unwind on Beautiful locally handcrafted rustic furniture. An Idyllic Getaway where you can soak in the surrounding beauty of the Smoky Mountains yet are just a few miles from town and a world of outdoor fun. 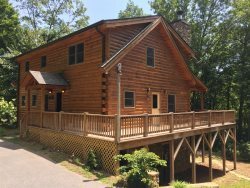 Inspired by the owner’s travels through the Swiss Alps, Wengen Chalet is a cozy mountain side retreat located only minutes from Bryson City and The Great Smoky Mountains National Park. The high elevation of Wengen Chalet offers year round long range, unobstructed views of nearby mountain peaks from the large deck, six person hot tub and screened porch. From the inside of the house an entire wall of windows brings the spectacular views inside for you to enjoy. 2 Bedrooms & 2 Baths: The first bedroom is on the main level with a custom built rustic king-size bed and private bath with large tiled shower. Second bedroom is also on the main level with a custom built rustic queen-size bed and access to second full bath with a tub and shower combination. There is a great open loft area with a Flat Screen TV, DVD Player, ample room for kids to play. The loft has a twin daybed with a trundle that can convert to a King for an additional charge. The thoughtfully designed and fully equipped kitchen, complete with granite countertops and stainless steel appliances makes entertaining a real pleasure. Upstairs is the loft with a couch that is perfect for lounging. There is also a Atari Flashback game system and DVD player in the loft which makes it a perfect space for entertaining children or those who are just young at heart. While the website was helpful, it was your staff that helped me make my final decision on which cabin to stay at and their recommendation exceeded my wish list. This was our first stay at this cabin and we are already planing our next visit. This is our 5th stay with you and I don't even think about booking with anyone else, you guys rock! We had an amazing experience staying in this cabin, so thank you! We spent most of our time hiking (Deep Creek, Clingman's Dome, Andrew's Bald) and really loved being able to come back to the most relaxing cabin. The hot tub felt amazing on our sore feet! We are doing one last hike off the Blue Ridge Parkway before heading back to Charlotte but we wish we were coming back here instead ... We will hopefully be back with the rest of our family so that they can experience the beauty as well! We had a great time at the cabin. The view and seclusion, plus an amazing cabin with great amenities was perfect for our vacation. We have been to the smokies many times, but this was our first time to Bryson City and we will definitely be back and to this cabin! Great trilliums and pink lady slippers on the driveway too! Secluded , yet million dollar views! Our family had an enjoyable stay at the property. The cabin was tastefully decorated. The view of the mountains was beautiful and we greatly enjoyed sitting on the deck in the mornings and hot tubbing at night. The screened in porch is lovely and quite comfortable for lounging, playing games or reading. Lovely cabin. Beautiful home. Extraordinary mountain view! Glad to get to spend great times relaxing here, and also hiking lots in the Smokys. We enjoyed hikes on the Appalachian Trails (from Newfound Gap), and the 6 mile Smokemont Loop Trail. Also thrilling to see Mingo Falls. And ... Anthony's Pizza. Mmm! Mmm! Many Thanks! Glad to get to spend great times relaxing here and also hiking lots in the Smokys. We enjoyed hikes on the Appalachian Trail (from newfound gap) and the 6 mile smokmount loop trial. Also thrilling to see Mingo Falls. And Anthony's Pizza MMMM MMMM! Team members were extremely helpful, both via email and telephone. This cabin was a perfect getaway for my family. I have never stayed in a cabin with such beautiful views. Although it was a good 15-minute drive from Bryson City to the cabin (with a LOT of twisty mountain roads), we found it with no trouble thanks to the extremely detailed driving directions. The view was absolutely breathtaking! I loved that there were great views from the living room, screened-in porch, and deck. We had a wonderful time at this beautiful cabin. Thanks for all the personal touches - Bath and Body Works toiletries, etc. My family had a wonderful time. We'll be back! We had a wonderful time at this beautiful cabin. Thanks for all of the personal touches. My family had a wonderful time. We will be back. Booking was a breeze thanks to the staff. The cabin was fantastic! And soooo clean, I was honestly surprised and incredibly happy with everything. Better price, Better Views! We had plans for another cabin but the pipes froze due to the weather. The company diverted us to this cabin gratefully. Even though it wasn't the planned place, my husband and I celebrated our anniversary in luxury. This was a great little cabin that suited our needs perfectly. I'm most grateful the place was open year round and ready and functioning. We had a lovely time. My husband and I celebrated our anniversary in luxury. This was a great little cabin that suited our needs perfectly. I'm most grateful the place was open and ready and functioning. WE had a lovely time. Everything was great! I didn't noticed the military discount until I had already paid and received the initial confirmation email. I probably missed it when signing up though. Thank you for the 10% refund however! The property was amazing! You could tell the cabin was going to have a great view just on the drive up there. Thank you sharing your cabin with us. Jay and I had a wonderful relaxing trip. The views from here are incredible. Bryson city is such a quant mountain town. We loved every minute of our stay. We hope to make this an annual trip. David and I had a wonderful time here. This was a much needed vacation for us. We enjoyed the snow on Thanksgiving and loved the snow while being in the hot tub. One of the best things was going through the Smokey National Park and seeing 2 different bears in the woods. Thanks for a cozy home and a great time. Always helpful. Always impressive and beautiful. Wouldn't go anywhere else for cabin rentals. We loved our stay at your lovely chalet! This vacation was the perfect start to out Thanksgiving break! We love the mountains and definitely enjoyed our stay. Thank you for such a great cabin and for y our beautiful outdoors. The team was great, even called to confirm we found the cabin. Great property and view. Thank you so much for sharing your house with us. It was a pleasure staying here. We loved the mountain view, and hot tub. We enjoyed visiting Gatlinburg and Clingman's Dome.